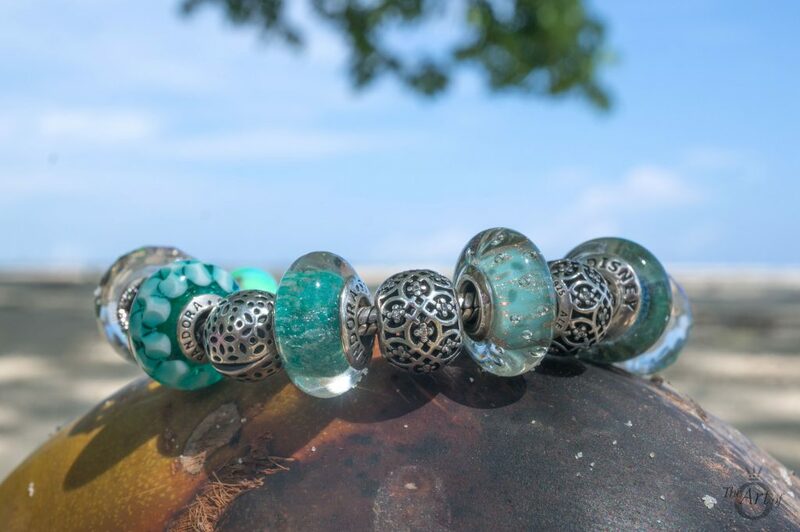 Stimulate your senses with this minty green Murano charm, full of golden glitter accents and hand-created bubbles. 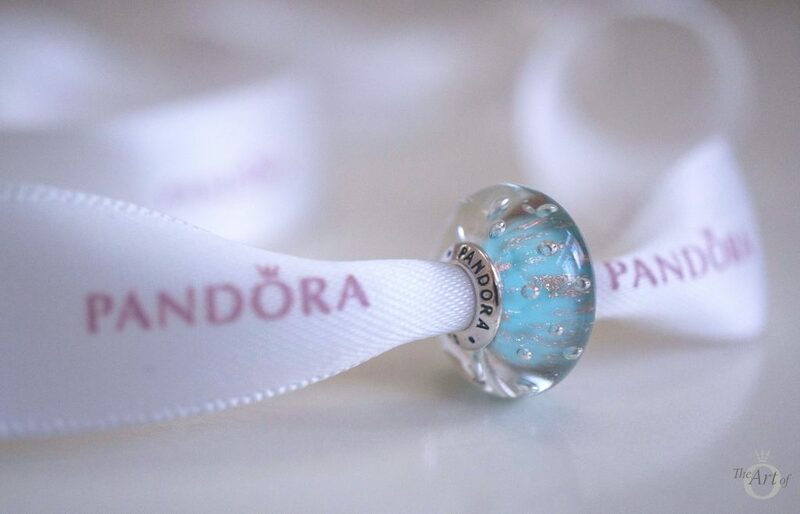 For many, the highlight of the PANDORA Summer 2017 Collection is the stunning, sparkly Mint Glitter Murano Charm (791669). 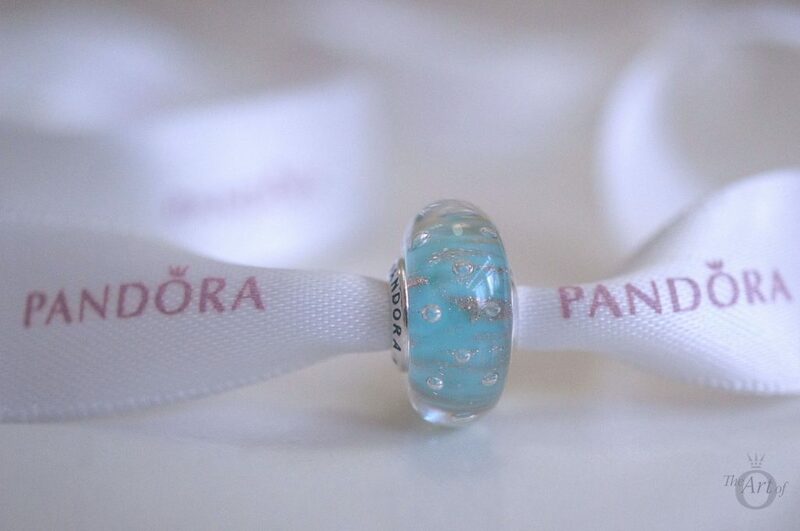 PANDORA is improving all the time with their Murano designs and the Mint Glitter Murano is absolutely charming! There is also a Pink Glitter Murano which is beautiful too, but I particularly love the minty green colour as it is epitome of summer! 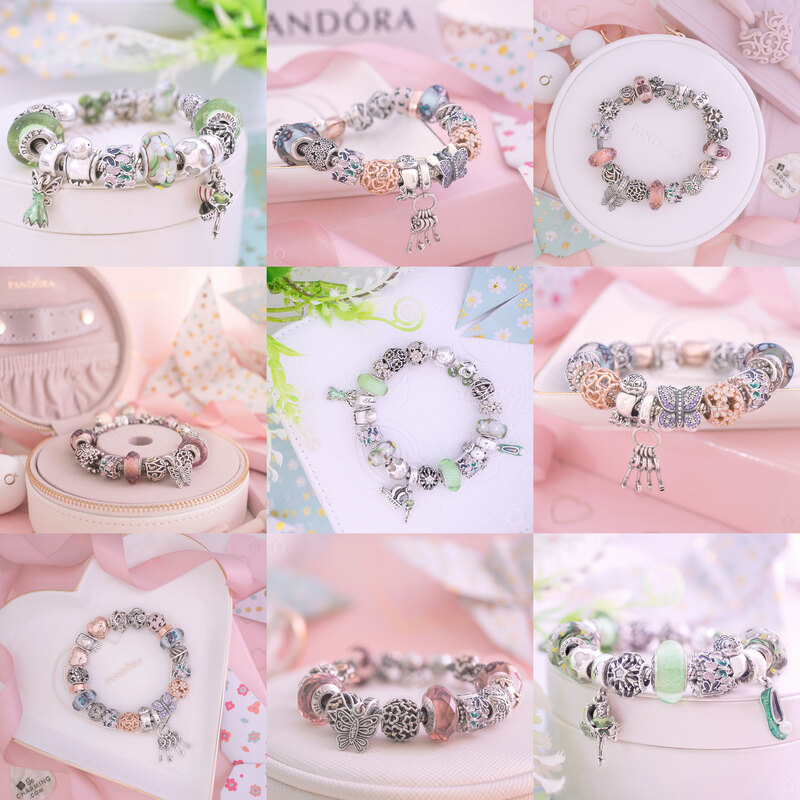 The Mint Glitter Murano Charm is very like the official PANDORA stock images. 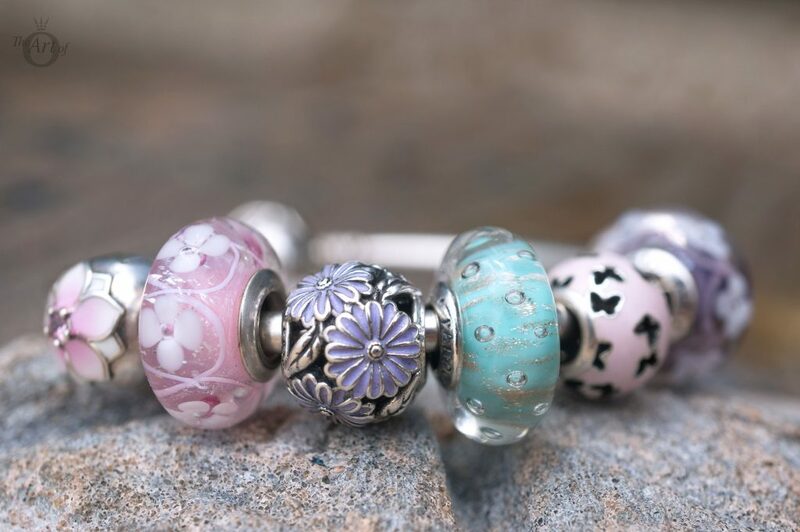 There are always some variations with Murano charms, as each Murano charm is unique due to being hand blown. However the overall design of the Mint Glitter Murano is almost identical to the stock image. In my own charm I would say the colour is slightly more blue than mint. Gorgeous, golden accents are scattered in the Mint Glitter Murano in a marble-like pattern. The glitter reminds me of swirling sand particles, dancing in the shallows of a clear ocean floor. 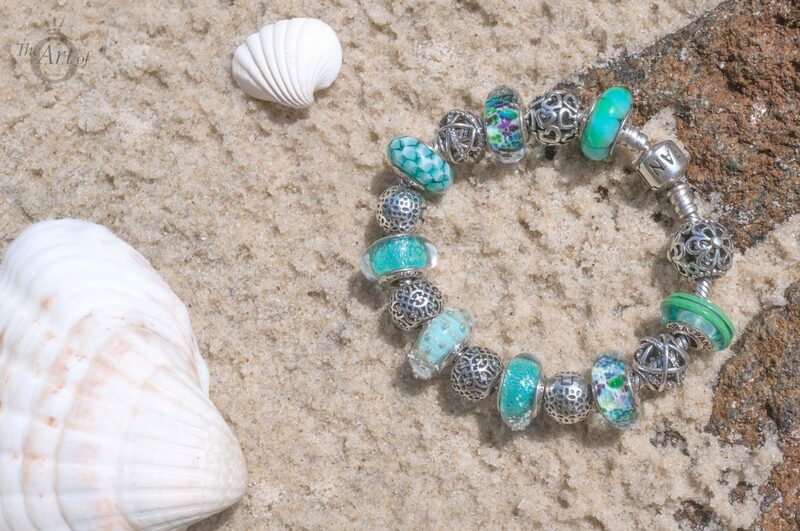 The added details of playful bubbles make the Mint Glitter Murano Charm perfect for summer trips by the sea. The glass bubbles are spaced delightfully and the overall effect resembles water bubbles surfacing from beneath the blue. 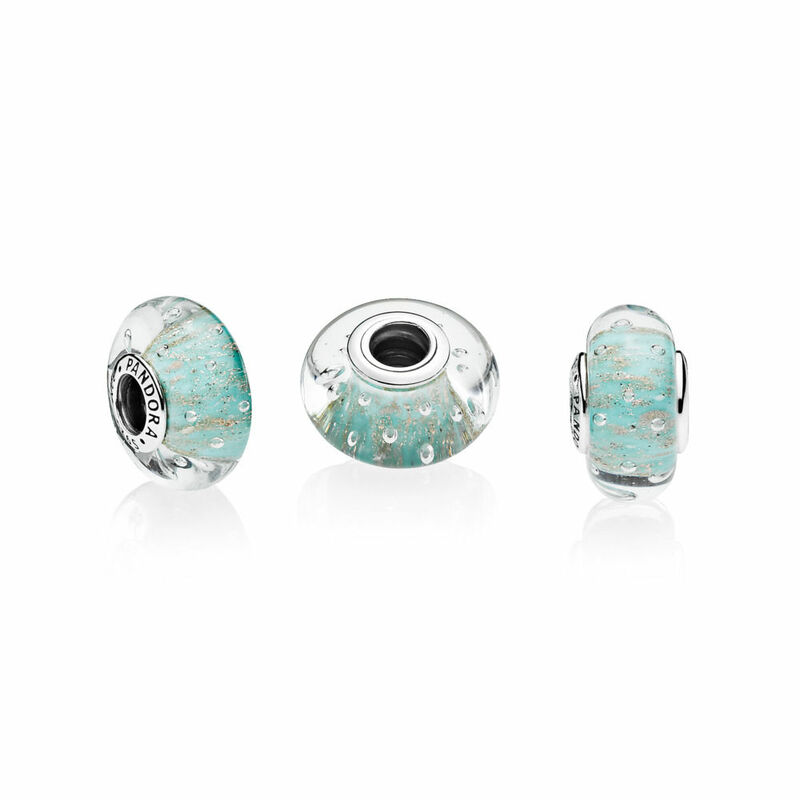 As usual for a murano charm, the Mint Glitter Murano is a threaded charm. 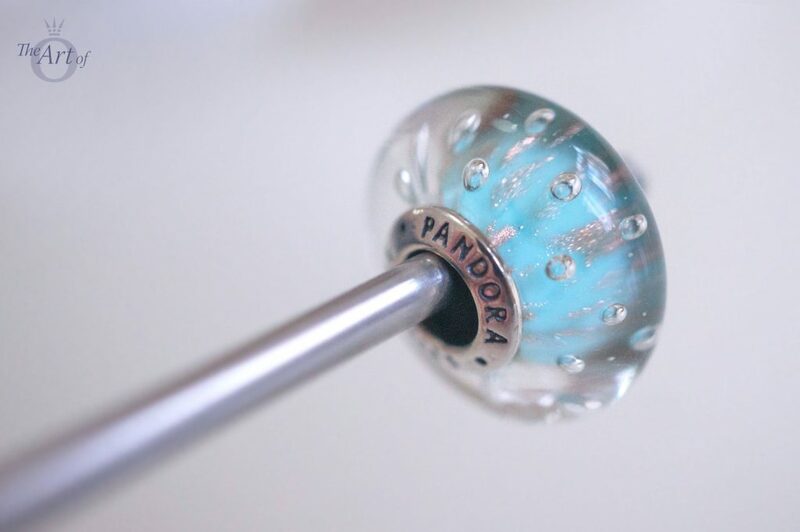 The standard PANDORA hallmarks are on side of the silver core. My first design is a floral theme and you can almost smell the pungent blooms! 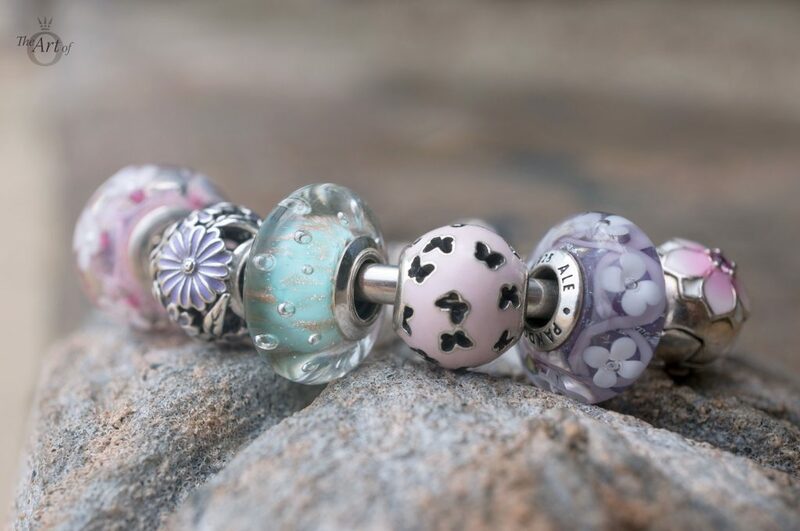 When I first saw the Mint Glitter Murano, I thought it would look sweet paired with the Pink (791665) and Purple Field of Flowers Murano Charms (791667) from the Spring 2017 Collection. The Magnolia Bloom Clips (792078PCZ) finish off this beautiful bouquet wonderfully and the bubbles in the Mint Glitter Murano resemble dew drops on the flowers. 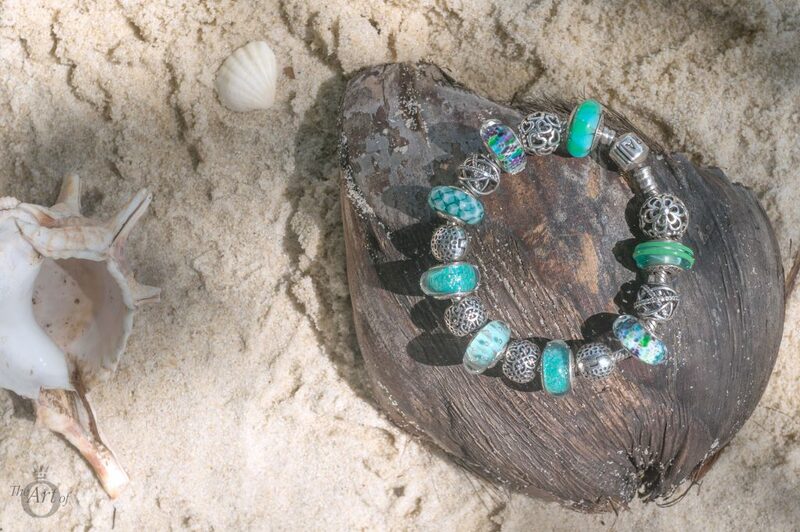 Leaving the flowers behind, my second design for the Mint Glitter Murano is a Sophisticated Seaside theme! 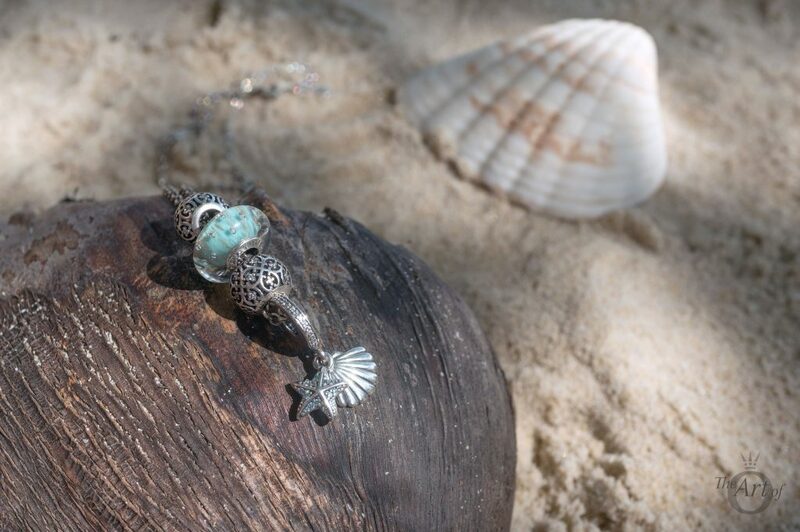 The Tropical Starfish & Sea Shell Pendant (792076CZF) sits at the centre and is showcased with the Disney Jasmine’s Signature Colour Murano (791648) which compliments the Mint Glitter splendidly. The Lace Floral Clips (791011) and the Intricate Lattice Charms (791295cz) are a simple yet elegant finish to this design. My next design is Murano Madness and is inspired from the fantastic marthnickbeads.com. 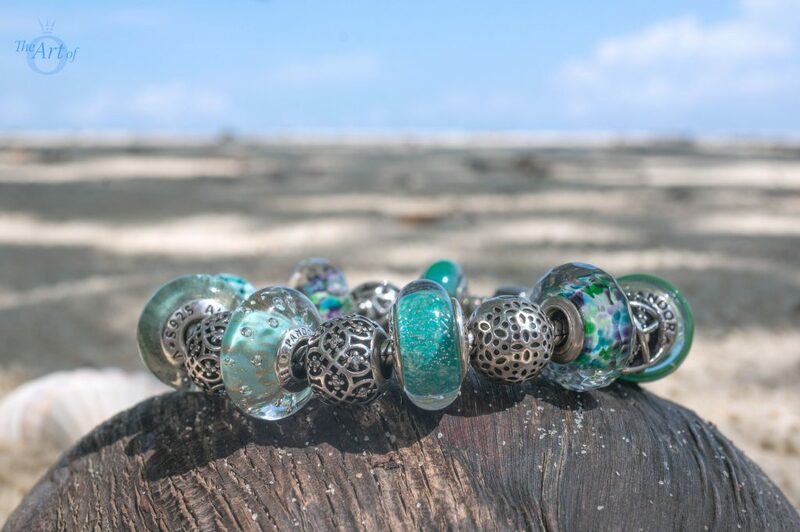 Check out her blog for some magnificent murano bracelets! 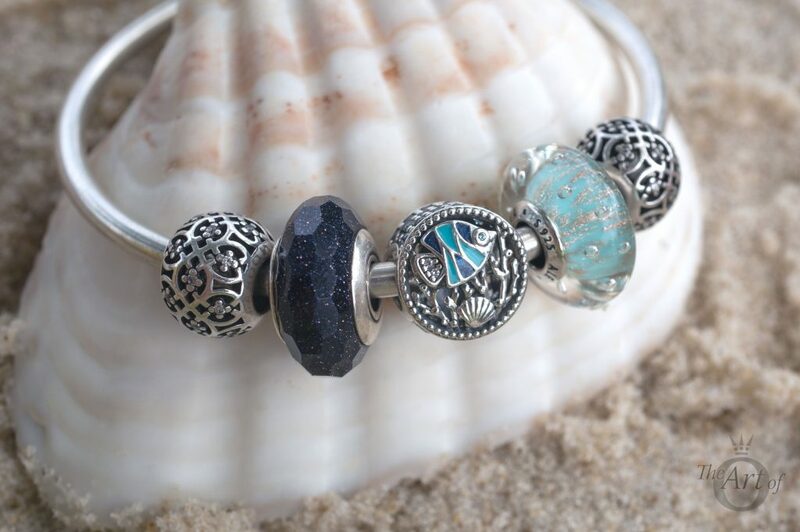 I used the blue and teal murano charms from my collection to create a bright and bold design filled with the different hues of the sea. 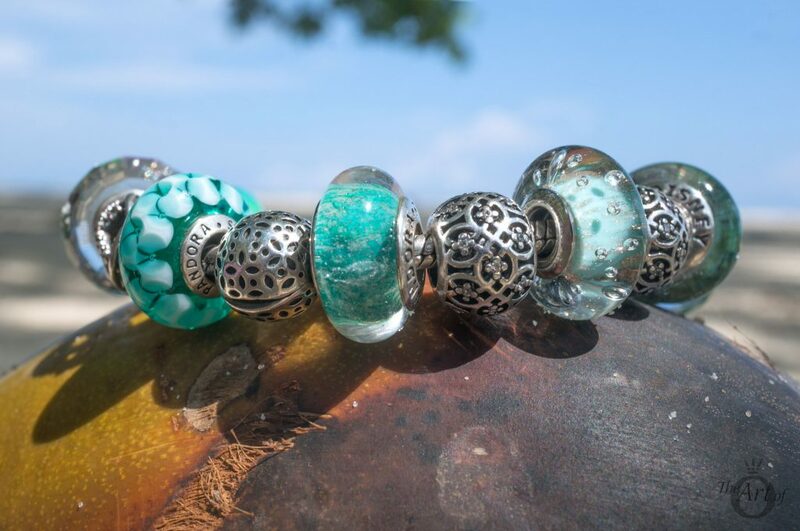 The murano charms used are the; Green Ribbon (790615), Tropical Sea Glass (791610), Disney Jasmine’s Signature Colour Murano (791648), Green Triangle (790636) with the Mint Glitter at the centre. 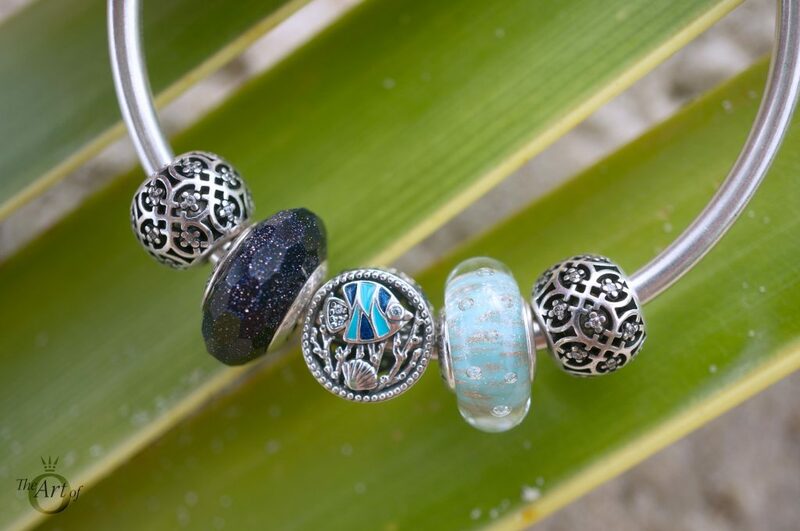 I love this bracelet design and think it’s a cute, glassy, classy style! 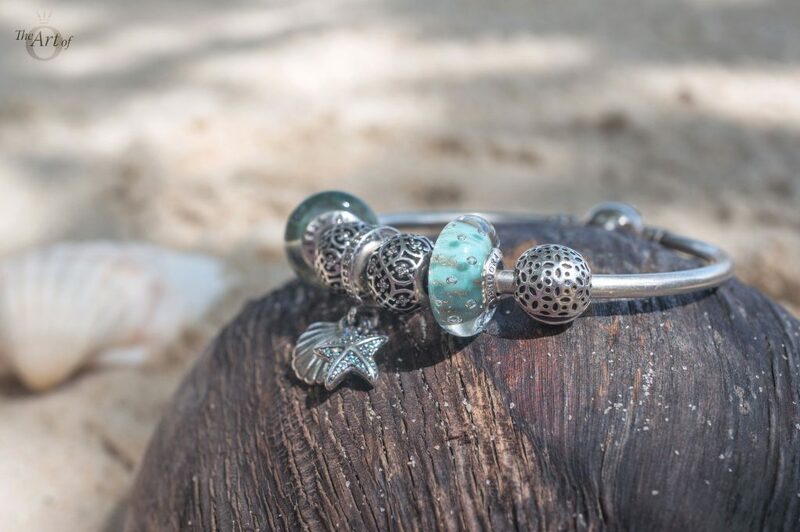 For my next style I went back to the Bangle for a mini Ocean theme using the Ocean Life Charm (792075enmx) as the focus of the design. The Aventurescent Stardust Murano (791628) sits handsomely opposite the Mint Glitter Murano and the little glass bubbles almost appear to be bursting out of the fishes mouth! My final bracelet design is a calm, carefree holiday theme. 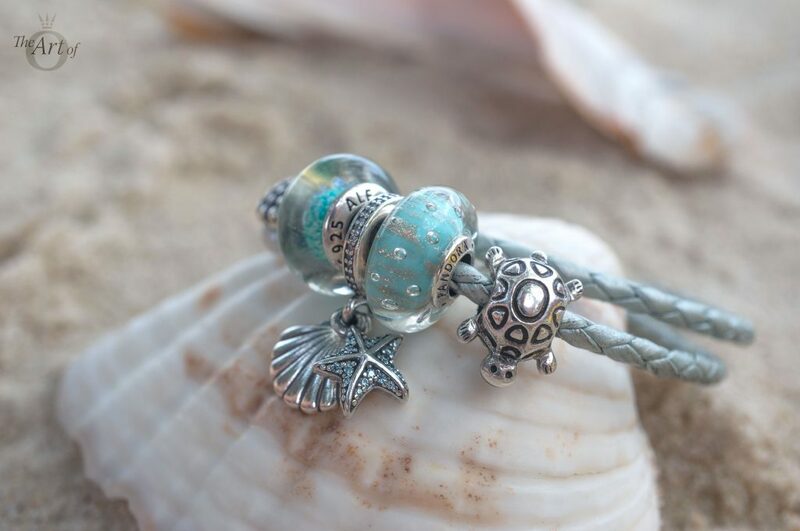 The Light Blue Leather Bracelet (590734cbl-d) sits prettily behind the Mint Glitter and Disney Jasmine Murano Charms with the Tropical Seastar & Sea Shell Pendent as a sweet focal point. 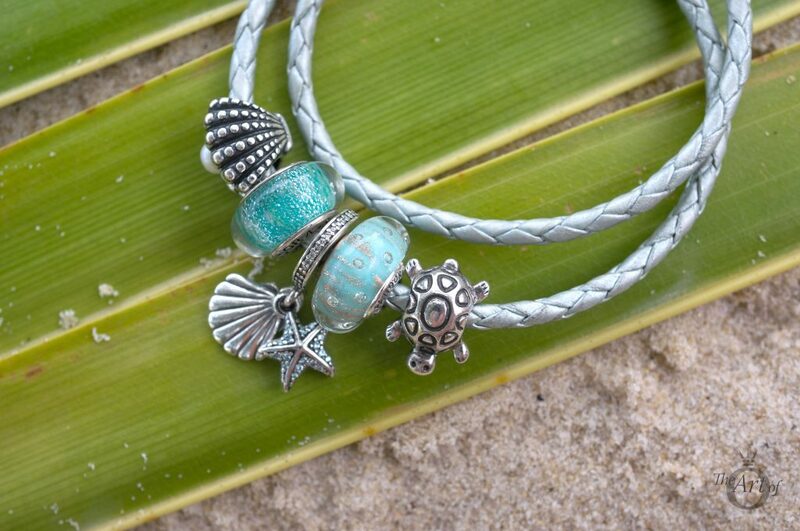 The Pearl Oyster (791134p) and Turtle (790158) charms add a splash of fun and character. 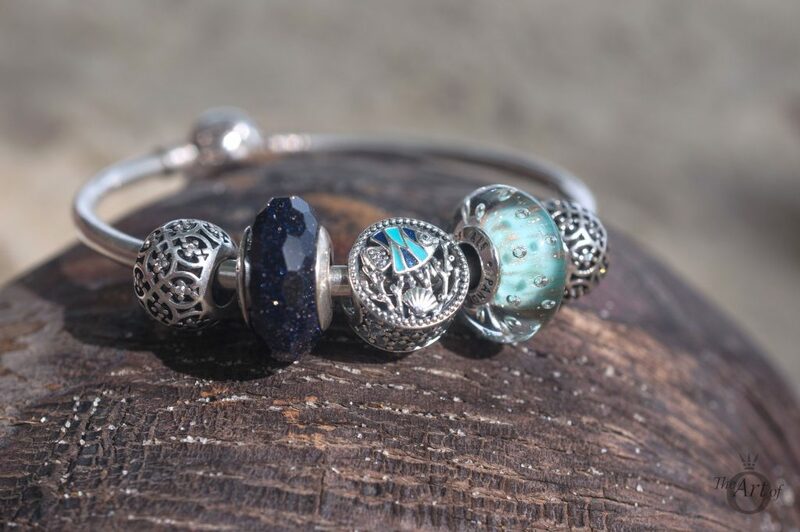 Murano charms are excellent worn on necklaces as well as bracelets. 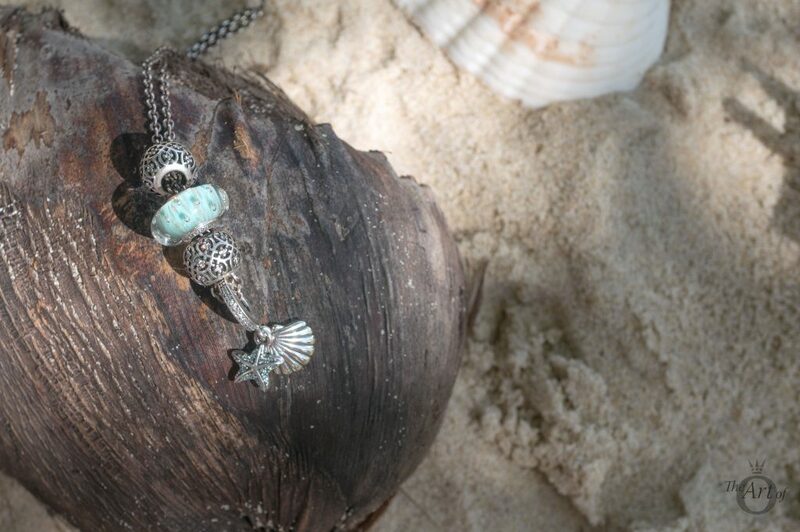 The Mint Glitter Murano adds emphasis to the delicate colour of the Tropical Seastar & Sea Shell Pendant. The Intricate Lattice charms complete this design graciously. 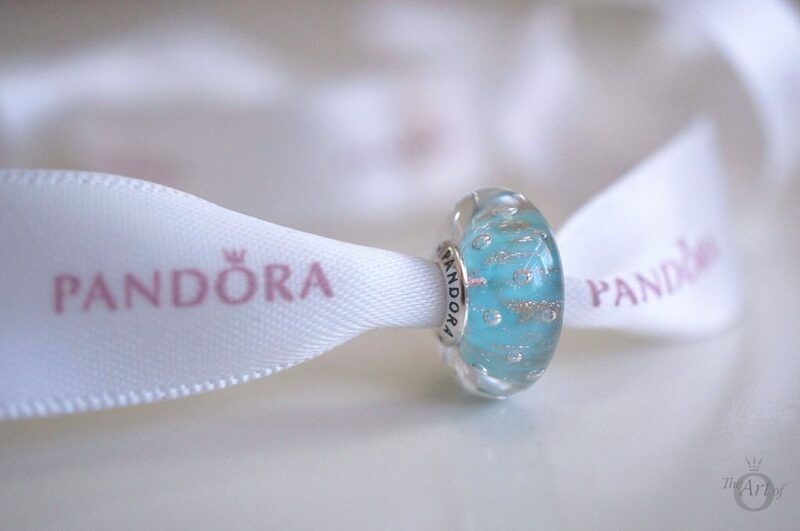 My verdict on the Mint Glitter Murano Charm? A shimmering success! 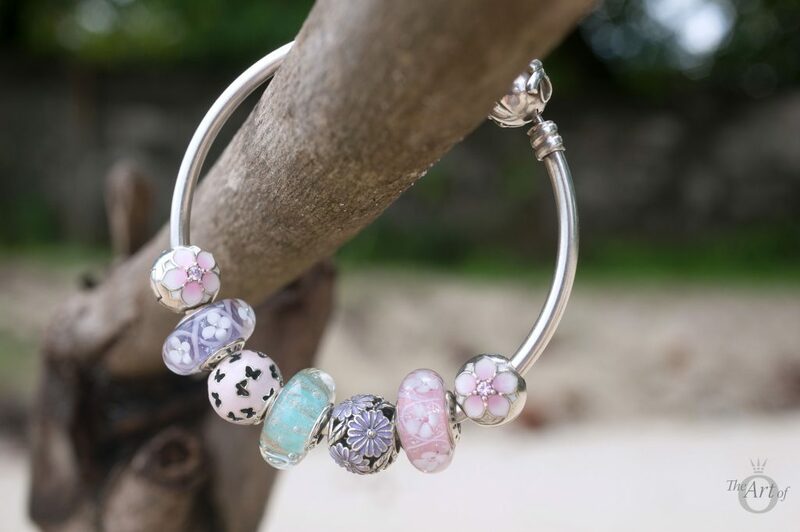 The PANDORA Mint Glitter Murano Charm (791669) is available for $45 USD / $50 CAD / £35 / €39 from our preferred PANDORA retailer BeCharming.com. 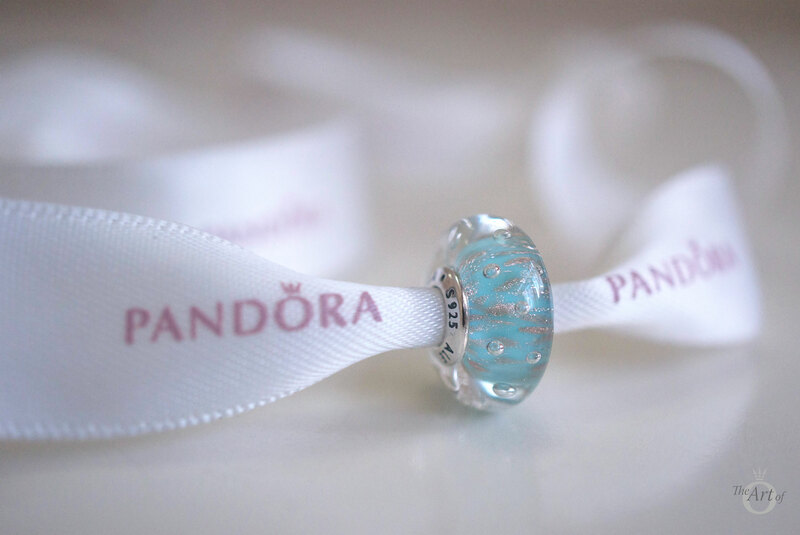 Have you bought the PANDORA Mint Glitter Murano Charm? Or is it on your wishlist? How have you styled it? Let us know in the comments below. Thanks so much for the shoutout. 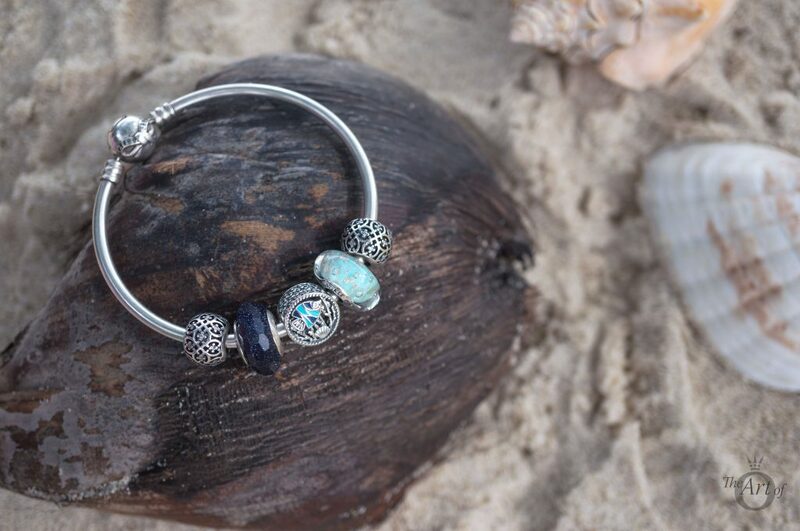 The more I see this charm the more I want to buy it and especially LOVE how you’ve styled it on the leather bracelet with the sweet little turtle! Gorgeous photos as always! Thank YOU for the inspiration! I love looking at your beautiful photos and one of these days you will succeed to tempt me to the Trollside!